G and I probably should have done this before Christmas but we just ran out of time so we are doing it now lol. 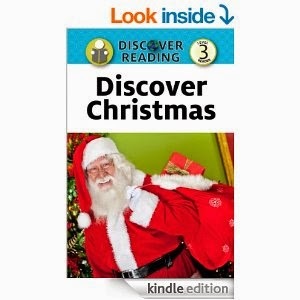 The Book G is reviewing is called Discover Christmas. You can get this book for $2.99 on Amazon here. It is a level 3 reader book. G and I give this book 4 stars. G says: I like how it gives you activities and stuff to do to get ready for Christmas. I think as a parent I like that it asks the child questions to get them involved in what they are reading. I also like that at the end of the book there are activities like looking up the definitions of the key words in the book. G says: I didn't like that it doesn't tell us what to do if we don't have a fireplace. We always put ours on the couch on Christmas eve and Santa fills them and hangs them on our bedroom door knobs so me and K have something to play with while we wait for everybody else to wake up. G only struggled with 2 words in this book and they were nativity and relatives. Using the context of the book he figured out what they meant but had trouble pronouncing them every time they were repeated. We are putting this book on our save list to read again next Christmas.